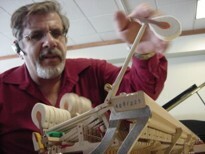 Born in Haifa, Israel, in 1952, son of Piano Tuner and Technician, Alfred Degen, Elian Degen inherited the passion for piano maintenance. From an early age, he studied with his father the secrets to take a fine instrument and take it to its best possible shape. Later on, he continued his studies in the London College of Furniture, and returned to Venezuela, where they had been living since 1958, he joined his father's business until his retirement, becoming the best piano tuner of the country, appointed to provide his services for the most outstanding orchestras both national and international.